Arita (有田) is a town in Saga, Kyushu, Japan. An express train runs directly from Fukuoka to Arita. Kyushu Ceramic Museum (九州陶磁文化館 Kyushu Toji Bunkakan) is located in Arita town. It is famous throughout Japan for its research on ceramics. There are large exhibits of old and modern style ceramics. Closed on Mondays, admission is free. Located near Kami Arita station. Arita Kan (有田館). Has an exhibition of modern art porcelain, 400 different cups for coffee or tea and a theater with mechanical computerized puppets made of porcelain. Admission is 200 yen. China On The Park. Experience pottery and porcelain design. The establishment dates back to the end of the last century when the Fukugawa factory was chosen to provide the Imperial household with porcelain. This large and modern style facility contains a factory, galleries, shops and a restaurant. Tozan Shrine. 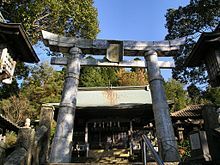 Famous for its porcelain archway and other items of porcelain, which are usually made of stone at other shrines. This shrine is and was particularly revered by Arita’s ceramists. Arita Hall Ceramic Puppet Performance. Based on the local folktale of the Giant Snake of Kurokamiyama, the world's first joruri (ballad drama) performance by ceramic puppets is held in the Arita Hall. The colourful stage is painted in the three styles of Kakiemon, Ironabeshima and old Imari. Rokuroza (ろくろ座). If you are really interested in pottery but only have a half day you can spare, then Rokuroza is the place for you. Here you can learn how to make your own pottery. Located near Kami Arita Station. RanRanRan A restaurant near the Arita Porcelain Park. Specializes in fried curry and blueberry parfaits. This city travel guide to Arita is an outline and needs more content. It has a template, but there is not enough information present. Please plunge forward and help it grow! This travel guide page was last edited at 14:12, on 14 January 2019 by Wikivoyage user Traveler100bot. Based on work by Wikivoyage users Wrh2Bot, Halowand, Syced, SteveRBot, The Anomebot2, LtPowers, (WT-en) Episteme and Jpatokal, Wikivoyage anonymous user 220.20.201.191 and others.